The first Powerchair Football event in the province was held on Sunday, November 16th, 2014 at the Greater Moncton YMCA and it was huge success with an excellent turnout! Soccer New Brunswick and Para New Brunswick Sport & Recreation got together in the past year to help make this happen in the East Region with the East Region Soccer Association. Powerchair Football (powerchair soccer) is a competitive indoor team sport developed for participants of all ages with physical challenges such as quadriplegia, multiple sclerosis, muscular dystrophy, cerebral palsy, head trauma, stroke, spinal cord injury and more that requires the use of an electric wheelchair (www.fipfa.org). With the help of Powerchair Football Canada and Juni-Sport, a Powerchair Football team from Quebec, coaches from the East Region and powerchair users got to discover and experience this amazing sport. The president of Powerchair Football Canada and assistant coach to the Juni-Sport Powerchair Football team, André Bougie, offered his help and knowledge on the sport as well as Jean-Pierre Des Grosseilliers, Head Coach of the Juni-Sport Powerchair Football team from Quebec. With them, they had the presence of 4 athletes from the Juni-Sport team, all of different ages and levels of physical challenges. These athletes were able to guide and show the participants the nature of Powerchair Football in action during the technical session of the clinic. The experience and knowledge they shared with us, was very eye opening and resourceful to help develop this discipline in New-Brunswick, starting with the East Region and to offer a meaningful and significant exercise opportunity that promotes quality of life, team work and fitness as well as improve fitness, wheelchair mobility and enhance executive processing skills needed for everyday function. With this clinic emerged 2 committed coaches and 14 NB participants. Powerchair Football practice sessions will continue to be held at the Greater Moncton YMCA on the following dates from 1:30pm to 3pm where we ask participants to arrive early to get them set up: Sunday, Jan 11th, 2015 (more dates to be confirmed). 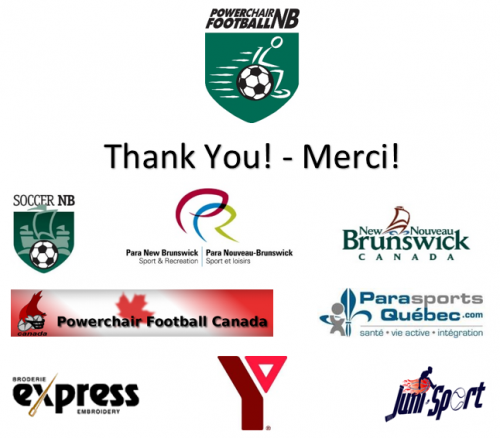 We would like to recognize and thank our partners who helped make this event possible: the Government of New Brunswick, the Express Embroidery, the Moncton YMCA, Juni-Sport Quebec, Powerchair Football Canada, Para Sport Quebec, Para New Brunswick Sport & Recreation, Soccer New Brunswick and the East Region Soccer Association.